Hoy has criticised the attitudes of both motorists and cyclists. Six-times Olympics gold medal winner, Sir Chris Hoy, has called for an end to animosity between motorists and cyclists and criticised both for their behaviour towards each other. His comments are sure to chime with the experiences of both sides in this country, where relations between cyclists and motorists are becoming increasingly fractious. In Dublin and elsewhere, a number of incidents have been reported by cyclists of their being forced off the road by taxi drivers and other drivers. In turn, many drivers complain of bad behaviour on the part of cyclists who ignore the rules of the road and carry on through red lights. "If you are cycling and thinking 'Well, they can sit behind me for half a mile on this single lane road' ... it's not about saying you should get out of the way and let them through, it's about, when they do come past, just give them the thumbs-up and you can see the road's clear, give them a wave through, say thanks and that little bit of communication helps", said Sir Chris. 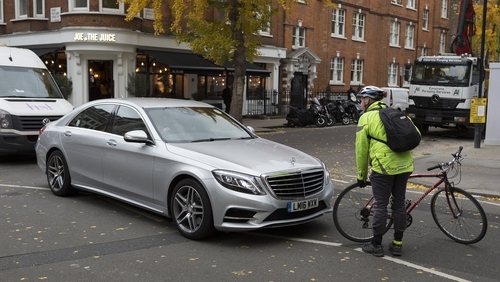 He told the Cheltenham literary festival that the recent increase in the popularity of cycling - particularly in urban areas - has changed the dynamic of driving. He said that in heavy traffic cyclists are often the fastest people on the roads, more agile at getting through gaps than motorbikes, and they are not always seen by drivers, according to the Daily Telegraph. Cyclists complain of drivers winding down their windows to hurl abuse, he said, while motorists make similar complaints. He added that motorists also needed to understand when cyclists experience "having a wing mirror buzz past your ear that it is utterly terrifying". "At the risk of getting too political about it all, in my opinion, when it comes to urban environments, or indeed anywhere riding a bike, it shouldn't be a cyclist hit by a motorist or a confrontation between a taxi driver and a cyclist," he said. "We are people trying to get around and, whether you choose to go on foot, on a bike, a taxi, a bus, we are people trying to get from A to B, and you should remember that we are all someone's son, daughter, mother, father, brother or sister. "People's lives are at risk and it's time to stop having a them versus us. In reality most cyclists drive and vice versa. We have to try and put ourselves in the shoes of another person."